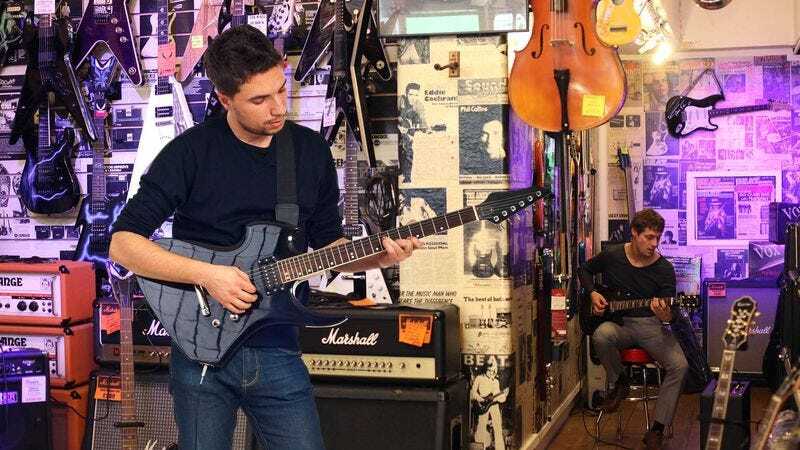 WESTLAKE VILLAGE, CA—Contradicting conventional wisdom that shopping at the musical instrument retail chain guarantees one a renowned and highly successful career in music, a new study released Monday revealed that a mere 88 percent of Guitar Center customers go on to become famous musicians. “While these findings may surprise anyone who has ever watched a Guitar Center customer noodle around on a Martin that is well out of their price range or play a slightly off-key rendition of Joe Satriani’s ‘Surfing With The Alien’ through a Marshall practice amp, our data indicate that as many as 12 percent of these individuals will never make it big,” the study read, adding that though music executives regularly prowl the store’s aisles, scrutinizing the deafening clamor of 20 guitars being played simultaneously in hopes of finding the next Eric Clapton or Steve Vai, the reality is that an alarming 1 out of 10 patrons of the music equipment superstore nationwide manage to fall through the cracks. “Granted, most of these individuals still achieve modest success, putting out a couple of solid albums and attracting a strong regional following, but they just never quite reach the level where they’re selling out stadiums night after night on massive world tours.” The study went on to conclude that every one of Guitar Center’s customers would almost certainly become international music celebrities if they started buying the most expensive kind of strings.